No telling with that cobra alarm. That Cobra alarm is the absolute biggest piece of junk, not that anyone asked. I couldn't wait to get rid of mine. You can buy a $99.00 alarm that functions better. That Cobra is JUNK! Who ever heard of an alarm that locks you out of your car when your key fob battery goes dead? JUNK! Not to mention 10 other bad features. Total garbage. Anyway, good job installing the hitch. Shawn tow's 250 miles round trip at 80MPH. It works great. unlike the Cobra junk. For hooking up the lights on the trailer I built my own wiring system, which should at least reduce the current drawn to the trailer through the car's lighting system and (maybe) avoid messing with the alarm electronics. The only thing I draw off the car power is the running lights and a little current for switching the brake/tail light. The brake/tail lights probably draw the most current, but one could easily also add one more relay to my system to not draw power for the running lights directly from the car either, but to date I've had no alarm weirdness with the stock '05 alarm. All of the above was done putting the relays in a project box, and soldering the wires to the relays so that everything was protected from the soft top flopping around in my trunk. The running lights I just wired normally tapping off of the elise's running lights. This works because when neither tail light nor brake are lit no current flows through the coil and the relay remains open because there is no voltage. When both tail light and turn signal are lit the relay also remains open because both ends of the coil are +12 volts and no current flows. If the brake is on one side of the coil is +12 volts and the other side is attached to the light bulb of the turn signal, which is attached to ground, so a small current flows through the coil, through the bulb and out to ground (the coil has significant resistance and won't let enough current through to light the turn signal). The same thing happens if the turn signal comes on when the brake is off only in reverse. Once I built it (about 2 hrs including trip to radio shack) I installed it in about 20 min (if you don't count time fiddling with one of the splice connectors which is unrelated). i am a little late to this post, having followed another thread about a tow bar... >< so the question is: are there any more left? i see the product is still on the BOE website, so i wanted to make sure before i clicked on the site to buy it. i don't care for the color, as long as i can get one. "What's my quarter-mile time? I dunno, I turn before I even get that far..."
oh, there is hope!!!! i will place that order now, thanks phil~~!!! (edit: order placed from account). i specified black, but if that 3rd one you have is silver, then send me that; it's fine. Last edited by mike325ci; 04-29-2009 at 12:17 AM. yes, i received it over this past weekend. but i didn't have a chance to work on it. i will post up results and thoughts once i do that. thanks, phil!!!! I'd like to get a bar but my car has a ReVerie 5 element diffuser, longer and lower than stock diffuser. Do you think it will fit? I finally got my trailer together and used the tow bar this weekend.... Absolutely friggen awesome... Thanks for putting these together for us. 2006 Exige; TVS Supercharger, Adj Sway Bar, Ohlins Suspension, BSK Oil Catch Can, Moroso Oil Pan, ORC Clutch, BOE Exhaust, Black Volk Racing CE28N's w/ Toyo R1R's, 2 piece rotors, Pagid Black Pads, BSK Wet Carbon (Side Skirts, Front Lip Spoiler, Gas Cap Cover, Center Console, Door Panels), Dry Carbon rear Diffuser, Harness Bar, BWR Gauge Mount, OMP Superquadro steering wheel, LETSLA Short Shifter, V2arms, Rear Tow Link Brace, RLS Battery Bracket, BOE Tow Bar, Stickers. Last edited by Dragon; 06-06-2009 at 09:57 PM. Nice looking set up. 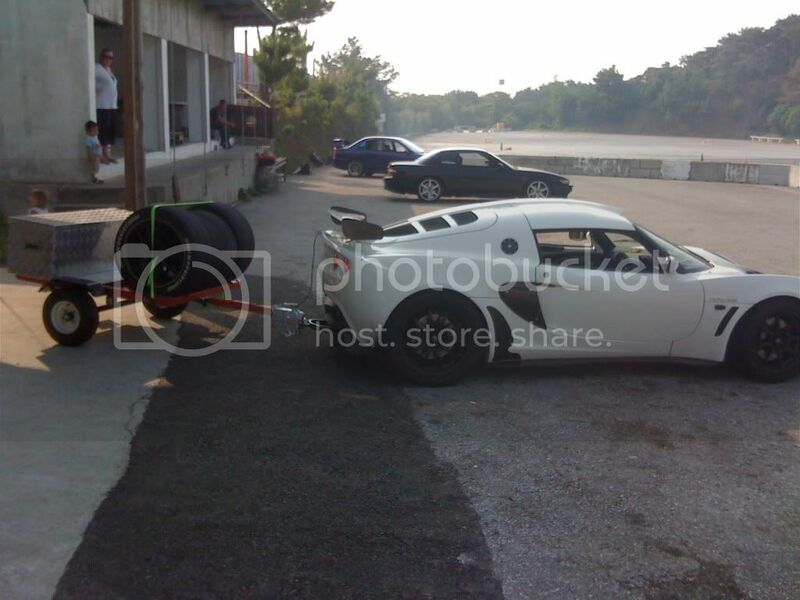 What's the tongue weight with the tires up front? You must have some heavy stuff in the box. How far is the tow? I would guess maybe 40-50 lbs on the tongue weight... Box has a lot of tools, aluminum race jack and small air compressor in it. 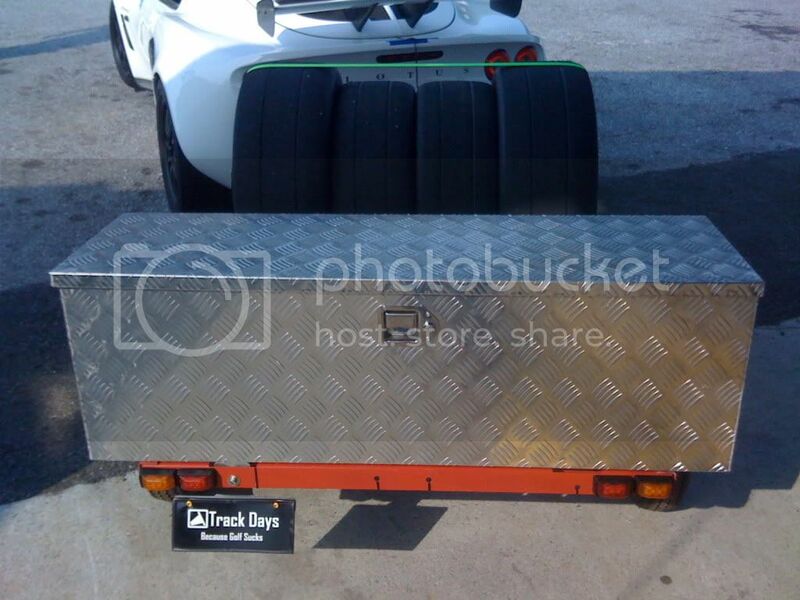 I would guess the total weight on the trailer to be around 250-300 lbs or so. I'm going to make a mount for a scuba tank to fit some where on the trailer and then use a reg to drop the pressure down to 120 so I can run some air tools. Also have a few more things I want to do to it as well.. The tow is about 70 miles or so and the last 2 miles are up a mountain with lots of curves and rough roads, but I still took it pretty quick with out any issues. I got my bar installed and found 2 used trailers but both are 12" wheels. 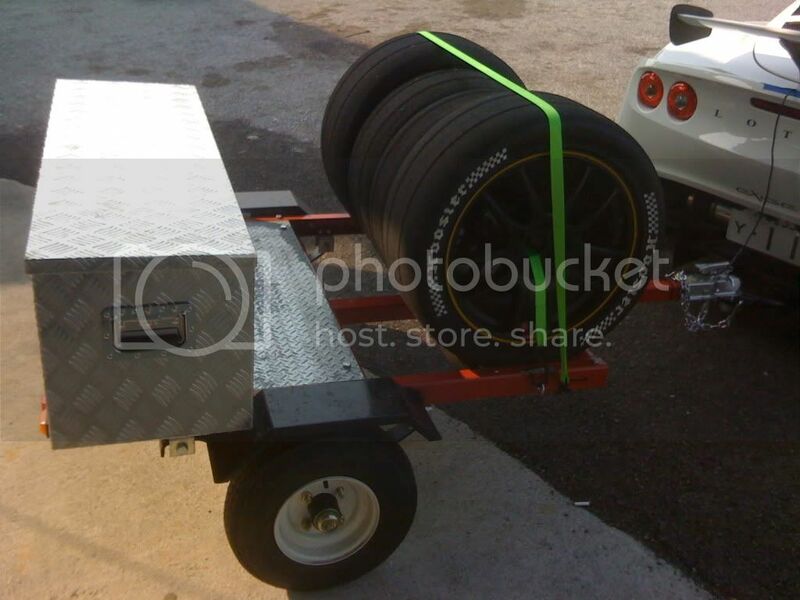 As our cars are pretty low, will it be any height mis-match issue to tow a 12" wheel trailer? Thanks for the answer, Phil. BTW, the bar looks amazing. It does not look odd on this car. With ReVerie 3 element + Sector111 eliminator kit, my friend commented it looks like a Transformer. Ha, thanks. Ya I think the bars look pretty good as well... For such a simple item, they are sure handy! Phil could we run one of those tow ball mounted bike racks to sit a couple of push bikes on it? The weight of 2x bikes plus the rack would be less than 30kg. I haven't seen a ball mounted rack before, just the receiver mounted ones. There are receivers that will bolt to the hitch ball hole, and I presume that's what you're referring too?? ?